In the twelve years since this book was first published, a new generation of animal heroes has grown up and entered the entered the lives and consciousness of the Australian armed services and the public at large. In particular the explosive detection dogs working with the forces fighting Taliban insurgents in Afghanistan have become justly famous: none more so than the black Labrador-cross Sarbi, who was taken captive and recovered after more than a year, received the RSPCA Purple Cross on behalf of all the Australian dogs serving in that conflict, and who is now mounted and on permanent display at the Australian War Memorial. As warfare, by its very nature, usually leads to such things, the Society doesn’t make its animals available to the military. To what extent this may seem at odds with the public recognition it gives to them is a matter of opinion – though you can be opposed to conscription yet still acknowledge the bravery shown by conscripts on a battlefield. Still, it does raise the broader ethical question of the use of animals in war, for none of them ask to go. they’re all sent by humans. The RSPCA position, a spokesperson says, is to encourage other methods that don’t place animals – or people – in harm’s way, and to reduce the number of animals used in conflict and seek alternatives to them. But in a violent world, there remains the dilemma of competing practical and ethical priorities a commander may face: is it better in an emergency to have a dead animal or a dead human as the victim of an attack? And where a dog has traits that can be of use to the protective services, is it not better to let it have a useful working life with a high standard of care, than have it put down – as sometimes happens – when it cannot find a suitable domestic home? Whatever view you take on this, the fact is that many new memorials have been erected to them in recent years: to the six explosive detection dogs and four combat assault dogs that were killed in Afghanistan and to the military working and service dogs generally. Their value in detecting hidden explosives and other illegal substances, as well as their ability to track enemies, find people who are lost, to guard military facilities, and to assist as faithful friends those who are suffering the wounds of war, have become even more recognised by the public at large and the authorities. 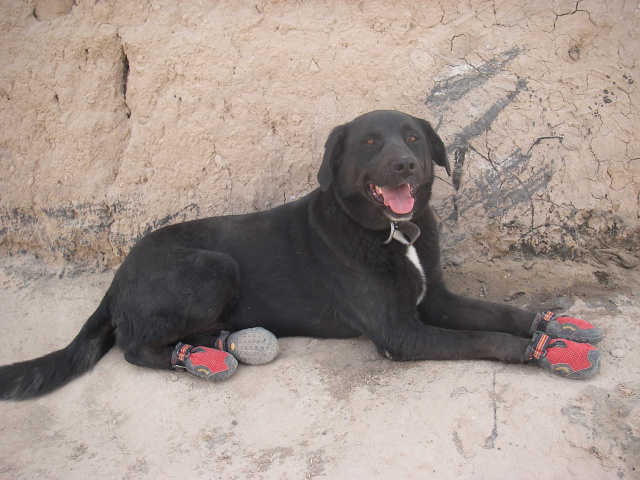 The dog sections are now highly-regarded units within the army and air force. The dogs are now recognised with service medals. A number of organisations have been introducing assistance dog programs for veterans facing post traumatic stress disorder and other problems. 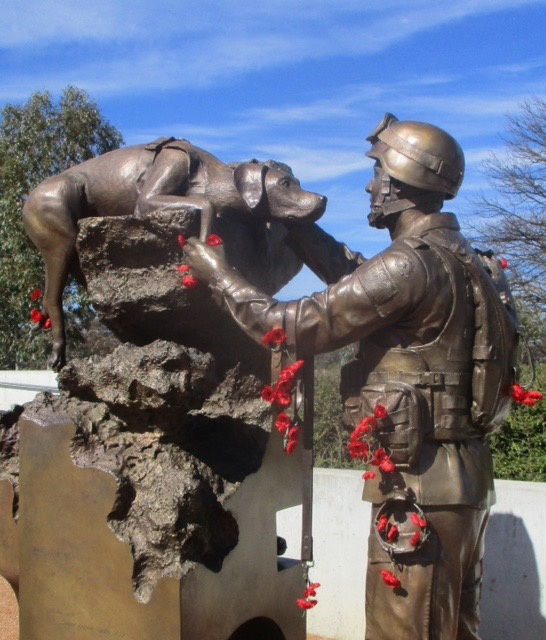 The very successful travelling A Is For Animals exhibition mounted by the Australian War Memorial, the animal open days that have been held there, Ewen Coates’ sculpture Elevation of the senses to the Afghanistan dogs and Steven Holland’s memorial to all animals in war, attest to the intense public interest – and compassion for – the subject. The very welcome decision by Penguin to publish this new and revised edition of Animal Heroes has allowed me to add the Afghanistan dogs to this collection of stories, where they may take their place among their fellows from earlier wars. I've updated information on those who are still living – both Snappa the crocodile and Courage the wedge-tailed eagle are warrant officers now – as well as explore new material that's come to light concerning the eventual fate of Horrie the Wog Dog. I've also taken the opportunity to add some new stories: a couple from the colonial wars of the nineteenth century; a few great mascot stories including, from General Peter Leahy, the pig Willy; the late George Gray's tale of his tracker dog Pedro; and an acknowledgement of the very small creatures – the flies, fleas, lice, spiders, ticks and mozzies – that are part of every soldier's life in the field ... companions-in-arms as it were (and under-the-arms, and in many other places as well). So let me thank everyone mentioned in the Acknowledgments and Chapter Notes who have helped with this project over the years. And as I remarked in the first Introduction to this book, while the memories are still there, and the old photographs and letters can still be found, may these stories of just a few of Australia's animal heroes stand for them all. Lest We Forget.